Mezrich'd= To take a complicated potentially boring subject and remove all the boring parts, add a narrative, and dig up all the soap opera'ish details. The rise of Vladimir Putin is Mezrich'd in the best way possible in Once Upon a Time in Russia. This book has more political machinations and less gambling then most of Ben's previous books but it is still a non stop roller-coaster of a read. Learn about the Oligarchs who put Russia's leader in power. Their lives of excess and ego are on full display and their magnificent fall from the top too. But is this retribution at the expense of world peace? Only time will tell. Meet two larger-than-life Russians: former mathematician Boris Berezovsky, who moved into more lucrative ventures as well as politics, becoming known as the Godfather of the Kremlin; and Roman Abramovich, a dashing young entrepreneur who built one of Russia’s largest oil companies from the ground up. After a chance meeting on a yacht in the Caribbean, the men became locked in a complex partnership, surfing the waves of privatization after the fall of the Soviet regime and amassing mega fortunes while also taking the reins of power in Russia. With Berezovsky serving as the younger entrepreneur’s krysha—literally, his roof, his protector—they battled their way through the “Wild East” of Russia until their relationship soured when Berezovsky attacked President Vladimir Putin in the media. Dead bodies trailed Berezovsky as he escaped to London, where an associate died painfully of Polonium poisoning, creating an international furor. As Abramovich prospered, Berezovsky was found dead in a luxurious London town house, declared a suicide. With unprecedented, exclusive first-person sourcing, Mezrich takes us inside a world of unimaginable wealth, power, and corruption to uncover this exciting story, a true-life thriller epic for our time—“Wolf Hall on the Moskva” (Bookpage). "A harrowing and truly Russian tale about the river of greed and corruption that gushed out of post-Communist Russia, carried men to power and opulence, drowned them in murder and betrayal, and led to the rise of Vladimir Putin." 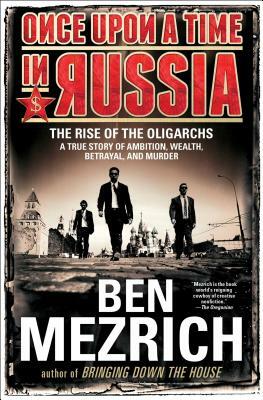 "Mezrich turns his keen journalistic eye to Russia...and...the oligarchs... Mezrich focuses on two such men, a mentor and his young protégé, who accumulated staggering wealth before personal differences tore apart their relationship... Mezrich's ability to tell a true (and well-documented) story in a way that makes it look and feel like the most involving of narratives is nearly unparalleled. He is one of the few writers whose name on a piece of nonfiction guarantees not only quality but also interest, no matter the subject, and this fine book is one more example of just how talented a storyteller he is." "Mezrich relates the story in the form of a true-life novel. The bestselling author has used the device before, including in The Accidental Billionaires, which provided the basis for The Social Network... Interviews, first-person sources, court documents, and newspaper accounts as the basis for his narrative... make the story more accessible." "With his knack for turning narrative nonfiction into stories worthy of the best thriller fiction, Ben Mezrich is one of our favorite writers." "Wolf Hall on the Moskva!" "Assassination plots, intimidation tactics, political maneuvering and money in unfeasibly large quantities… Based on a year of interviews with high-profile sources, it fleshes out almost 20 years of history with journalistic color and anecdotes." "[A] fascinating and often chilling read." "Ben Mezrich knows how to find a good story. In his latest, the Boston-based writer has a corker." "The real-life tale of ... Putin’s ascendency to power. After the fall of communism in Russia, a small new class developed, that of the oligarchs... the ambitious and opportunistic businessmen who led the wild and lawless economic conversion from state-run industries to market capitalism.... Mezrich’s well-written account of this era of Russian history illuminates the tumultuous conversion of communism to capitalism." Mezrich's most incredible story yet. A true-life thriller... a fascinating read.